Bible Distribution Ministry has been in our heart since we came to understand the importance of Bible in the life of a disciple. Our motto is : God’s word is free-Let every one have it. Hundreds of new people join the church in Nepal and they need the Bible. We accept new and used Bibles and share them with people who need them. Please join with us to share the blessing of the word of God to some one who cherishes it. Send us your unused Bible for some one special who is waiting for his own copy. Answered Prayer John 15 : 7, Prov 28 : 9. Victory over sin, Ps 119 : 9, 11, 1 John 2 : 14, John 8 : 31-32. Spirit filled living, Eph 5 : 18-19, Col 3 : 16. The word brings purpose to life, John 17 : 17-18. Spiritual Growth, Rom 10 : 10, 1 Pet 2 : 2. Fruitfulness, Ps 1 ; 2-3. Defeats the power of darkness, Mt 4 : 3-11, Eph 6 : 17, Heb. 4 : 12. Brings success to life, Jos 1 ; 8, Ps 1 ; 2-3, Jam 1 ;25. Equips us to be competent counselors, Rom 15 : 14, 2 Tim 3 : 16. It gives comfort and hope, Rom 15 : 4, Heb 6 : 17-20. It gives guidance and direction to life, Ps 119 ; 105. It brings joy, Jer 15 : 16. We distribute Bibles to our Pastors, Evangelists and workers. In December of this year we would like to bless Churches with the scriptures. We are praying for 400 Bibles. If you are led by the Holy Spirit to donate us Bible, we would be glad to know that. Another very important need of our evangelistic ministry is gospel tracts. Tracts are very easily handed out to people in Nepal. 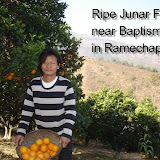 Bless Nepali Churches with the gospel tracts. Help us print more gospel tracts so that we can give to village evangelists. With your little help of just 200 US dollar helps us print ten thousand gospel tracts. Please consider being a part of this ministry by donating fund to print more tracts for our ongoing evangelistic ministry. We receive many requests from our churches for the bibles and tracts. We need partners who can help us purchase and print. We encourage you to put your money in God’s bank in your account by investing here on earth. God bless you. Please donate Bibles. God’s word is free let every one have access to it. Send us your unused Bibles, we will happily replace them in the hand of some one very needy. To know more about Bible Distribution Ministry, please click in a photograph above. We are a electronic company in Hongkong. Most of our members are Brother and Sister in Lord. In the middle of 2011, we are called to encourage people to listen the word of God daily. Thanks God that we are success to launch a “Audio Bible Player” at the end of 2011. This player are very suitable for elder, housewife. Thanks God that “China Alliance Press” are willing to be our general agent in Hongkong. Within the past year, more than twelve thousands player are delivered to China and Honghong. Now we just to encourage more and more brother and sister to join us. If you have the same mission or you have the outlet like “China Alliance Press”. Please contact us at “sms@semi.com.hk” . We will send you a free sample for testing. I submit this letter to your office for consideration. CAFFY is a faith based non government organization, Uganda. Hello, good to hear the audio bible player in Nepali but how much is the price? Thank you for writing. We have not found a place yet for Audio Bible Player, all we did and do was distribute to Christians who can’t read otherwise. And these materials we got from friends for free to give away free. They don’t produce in Nepal so it is hard to get in Nepali market. Good to hear the audio bible player in Nepali but how much is the price? Bible Society of Nepal has just ordered the Audio Bible but have not arrived in their store yet, so when it arrives it will be on sale. They did not reveal when it arrives and how much charge they are going to put. Praise the Lord. Greeting to you all in the most precious name of our Lord and Saviour Jesus Christ. We are writing this from the city of Chennai here in S.India. We are a small group of new believers in Christ. most of us speak the Nepali language and many speak Assamese, Oriya, and many other languages. However it is the love of our God and Saviour Jesus Christ that binds us together and the common link language among us is Hindi. WE shall be ever grateful to you all if we could get a few copies of the Holy Bible in Hindi as well as Nepali. presently we need 5 Nos Nepali and 5 Nos in Hindi. Our brothers from Assam and Orissa are just learning to read. We shall let you know when they are also ready to read the scriptures. Did you get what you wanted? Did you buy Bible yet? Where do you distribute bible to? How much is a Bible in Nepali ? Can I buy some bibles through your site? GospelGo distributes free Bibles in every language. Would you please provide us some Bibles to distribute the needy people? Hi i also work as a pastor at my church. So my physical address is here. Anyway, if you will provide me some more bibles to distribute, I will pay. Thank you. Hi, would you please provide me some bibles to distribute the needy believers in my area? Church Boys Foundation This is Church Boys Club which uses sports to communicate the people. Reuben Rai Ministry Reuben Rai Ministry and what he is currently doing in Nepal.